This chocolate cheesecake is truly majestic—unbelievably rich and incredibly impressive. Think of those berries on top as an edible tiara. Mix cookie crumbs and butter; press onto bottom of 9-inch springform pan. Bake 10 min. Meanwhile, beat next 3 ingredients with mixer until well blended. Add melted chocolate and vanilla; mix well. Add eggs, 1 at a time, mixing on low speed after each just until blended. Bake 55 min. to 1 hour or until center is almost set. Run knife around rim of pan to loosen cake; cool before removing rim. Refrigerate 4 hours. Top with powdered sugar and berries just before serving. 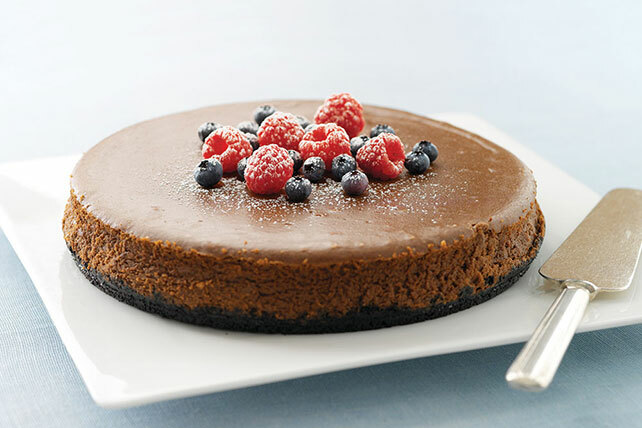 Enjoy a serving of this rich and indulgent cheesecake on special occasions. Use bottom of straight-sided glass to evenly press cookie crumb mixture onto bottom of springform pan.